The Daylight War is the third book in the Demon Cycle series, which is planned at 5 books at this point. So it is very much a middle volume. Relationships are tested, alliances are made, and demons are killed. What more could you ask for? A book you stay up late for because you're lost in it perhaps? Well that's what Brett has given us. As The Warded Man was Arlen's book and The Desert Spear was Jardir's the latest is Inevera's. While I do feel an important aspect of Brett's style is reveling in the back stories of his focus characters The Desert Spear felt too bloated on Jardir's part. 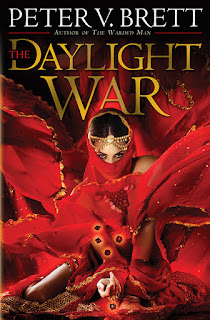 The Daylight War gives Inevera the limelight this go around and it was much more balanced showing more of what other characters were up to. In fact, I wouldn't have minded a few more chapters on her past as some aspects of her personality were not addressed as much as I hoped. My liking of Inevera's part could be due to the fact it was more interspersed throughout the book rather than being dropped in larger chunks as Jardir's portion was. Inevera's rise to Dama Ting is the mental game compared to the physical game Jardir rose to the top of. They are very much the two sides of the same coin. The female side of the Krasians society is explored in depth from the very bottom up. Brett's nod to his love of dice-throwing is finally showcased as we learn the secrets to Inevera's dice and how much they mean. Killing demons seems very secondary to most of the book save a couple very large battles. It really comes down to whether Arlen or Jardir will lead humanity or somehow find a way to work together again. Brett's characterization is at an all time high, giving each and every character nuance and depth. This is also the volume where I actually found myself liking Gared. Rojer begins to truly master his powers while also gaining companions of his own, which injects just the right amount of levity when needed. Renna goes to extremes to keep pace with Arlen while Leesha, having not decided on her options in time, is left with few alternatives. Renna's relationship with Arlen deepens in many unforeseen ways. She is keeping Arlen tethered to his humanity while she tempts losing her own. Yet even with all of this going on it was the trader Abban I kept waiting to hear from again. Abban comes alive showing his side of things. Or at least a partial view of his side as his grand plans are kept close to his chest. Mark my words he's up to big things. The ending, while fulfilling some promises, did feel very rushed. It was a confrontation that seemed to warrant more page time given the amount spent on lesser entanglements.The abruptness may also throw off some fans, but at this point I trust that Brett can live up to what he has done so far. I had the same thoughts regarding Jardir's backstory in the second volume, but seeing how he handled Inevera, I suspect it may have been deliberate. Dedicating so much uninterrupted space to Jardir's backstory kind of put him on an even footing with Arlen, further clouding the question as to which (if either) is the Deliverer. Good call on Gared. I was so consumed with Rojer's growth, and so annoyed with Leesha, that I completely overlooked how much I came to like Gared.